I would have preferred github over sourceforge, the quality of sf is poor these days, it is a faint copy of its better days, it has so many advertising, tracking and even add-on-downloads. Too commercial for my taste. For collaborating, github is so much nicer. If you want to use github, why not put it up there then. I doubt this is going to be a hotbed of activity that it can't be ported. I don't used Mads either, so I'll just stick with my Mac/65 copy of the code. Syntax conversion is done. Nesting analysis is in process. Interesting to see how the original files were merged together somehow. Maybe for speed of compilation when loading from disk or memory concerns. Unbundling reveals nice structures. Edited by JAC!, Wed Feb 4, 2015 5:28 PM. All compile time errors are fixed. First part of ordering the segments is completed, too. The $b000 bank is about 99% identical to the cartdump already. Edited by JAC!, Wed Feb 4, 2015 8:15 PM. That is so fantastic! Wow! 16384? Incredible! What a time! Christmas in February! And we are all part of it. In my view collaboration (working in a team) on Github is easier. It is not so much about 'git' as a tool, which is also available from SF. I will use SF, as JAC is more familliar with it. I had my projects on SF too, but after SF has been sold multiple times, my feeling is that the new owners just try to make as much money as possible with advertising and tracking of users. Github has a better business model, they charge for non-open-source projects, and the page is advertising free. But the main benefit is the way how code can be forked into local repos and then merged again, that makes collaboration on a project easier. Just couldn't got to bed without playing around with this. Splitting the 11 published source files into the original 34 source files is complete. Reordering is complete. The include sequence now matches the byte order in a type 15 one chip OSS cart. Just a few padding bytes, bank id bytes, text stamps like "ces" and maybe 1 or 2 wrong labels left. Current state is committed to sourceforge. since all other projects I'm participating in are on sourceforge and since it also supports git, that's my preferred environment. Yep, folks just need to not click on the ads etc. Should be trivial for sophisitcated computer users such as most of the people around here. Some good points there, but it isn't the end of the world to use SF. Everything except bank ids and the serial number seems to be OK now. The bank ids require some sleep, due to the total mix of types and dump versions (3/15/43). Just can't get it straight in my head now. Also not sure about the serial id at $32fb. That's $0000 in the source because it was set as part of production as it seems. Is there any chance that you can relieve us of this accursed OSS cart format, altogether? 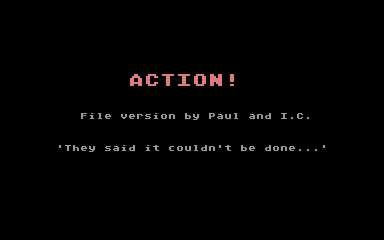 I have a Bit-3 80 column board in my Atari 800, and always wanted to take advantage of the Action! 80 column functionality, but the cartridges themselves have always been prohibitively expensive. Even nowadays, the ebay price is always high, and you never know what version cartridge it is. Is there any hope that you could convert this thing into something that could be used with SIO2PC? Is there a schematic for Bit3 anywhere? Failing that, has anyone photographed the front and back of PCBs? Some time ago, I managed to source the main video chip from that device. I would love to clone it since I don't think I'll ever manage to get to buy one. As far as I know it has not been emulated, either. I can take photos of it, for you, sometime this week. If you can physically reproduce it, then, perhaps, it's functionality can be added to the emulators, if you share the knowledge that you gain while reverse engineering it... that would help everybody. 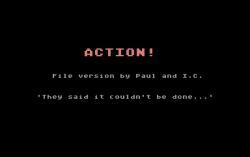 Editing Action code in 80 columns could really inspire a lot of people to code new stuff for the Atari. It's such a well thought out language, but working with it in 40 columns is far from ideal when doing well-structured procedural programming, because you can't tab as far as you would like to, and separate the code blocks nicely, etc. As far as I know, the Action! cart is running with 80 columns. And(!) 80 is just the beginning! OSS 6 in 1: with Bug /65 ? CU all out there in the galaxy. Let the new Atari age begin! Edited by luckybuck, Sat Feb 7, 2015 10:26 PM. >Is there any chance that you can relieve us of this accursed OSS cart format, altogether? The binary will be available in multiple output formats, including the OSS formats so people can update their carts. 16k plain ROM is fairly straight, once the source is relocatable. Of course it comes at the expense of 8k less RAM for code & source. That's why OSS came with that special design for their productivity cars. >Is there any hope that you could convert this thing into something that could be used with SIO2PC? 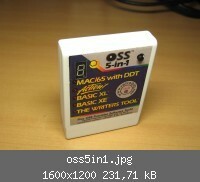 Similar to the 16k Plain ROM. Of course loading from disk always comes with the risk that a bug also trashes ACTION! itself. On idea that I have is to have a version that uses the RAM under the XL OS optionally as "backup". If there anything special in ACTION! itself, apart from the fact it uses the E: handler? Now that's what I call fun with code. It took me quite a while to understand this until I finally encountered the "inc sargs,x". ;	activates conditional assembly of eleven self-destruction code fragments. 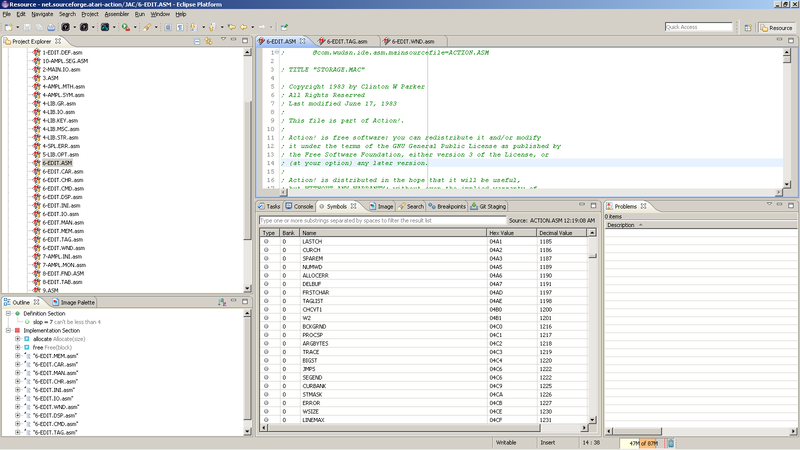 ;	a file version that can be loaded to the RAM of the machine. ;	When the Action! code is in the ROM area, these code fragment have no effect. ;	When the Action! code is in the RAM area, thee code fragments destroy the code. ;	run from the machine RAM or a special RAM cartridge. 25 = 0001			ramzap	equ	1	; to zap or not to zap, that is the question? JAC! You are a miracle! Wil try to get the Basic XE source, too. Edited by luckybuck, Sun Feb 8, 2015 4:35 PM. The one thing I wonder about is what the "AMPL" in the file and label names stands for. "Action Machine Programming Language"? Or even related to this..
What about using extended memory? I would think most of us that want to use it have more than 64K in our Ataris. And what about extended memory for code space and compiling? Enough questions from me, what you've done is incredible!